This evening PI9ISS (André Kuipers) was active from the ISS space station. The signal was loud and clear but there were many stations that wanted to make a connection so for me this time it wasn’t possible to make a connection. During the pass at 19:30 CEST we will give it another try. The dutch astronaut André Kuipers is ready for takeoff. 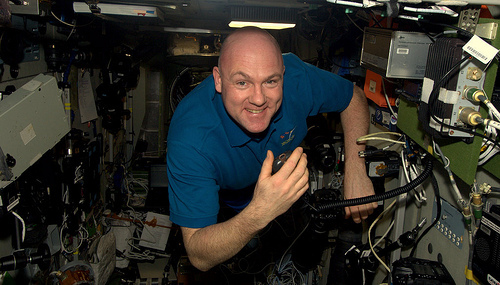 Another two days and then for the second time Andre Kuipers will leaves to the International Space Station. A historic journey, because Kuipers will break various records. Thus he becomes the first Dutch astronaut in space for a long time, which is nearly six months. He is also the first Dutch astronaut who is launched for a second time. Other Dutch astronauts – Dr. Ockels and Louis van den Berg were “only” launched once. The launch of André Kuipers can be seen live next Wednesday 21-dec-2011 on dutch television channel: Netherland 1 (13:20 pm to 14:45 o’clock CEST). You can follow Andre on any of his social media (Twitter or Facebook). 2nd.spaceflight Dec 21st 2011, 13:06 GMT, Soyuz TMA-3M. ISS expedition 30, ESA’s PromISSe mission. Till May 16th 2012. Next to scheduled ARISS contact with schools and similar organisations, Andre will occasionally contact the ground as PI9ISS.